Planning a kitchen doesn’t need to be a daunting task, here are 8 critical points you’ll need to consider if you’re going to get the kitchen of your dreams. Every successful kitchen design contains a simple formula, known as the kitchen work triangle, or golden triangle. This triangle is the invisible line between the hob, sink and fridge freezer. The idea is to make access easy between these three points, so that cooking, washing up and preparing food is simple. Avoid putting any obstruction (such as a wall, unit or doorway) between any part of the triangle, and you should find your kitchen feels convenient and spacious. When you buy a new kitchen, you may recycle old appliances, or sell them and buy something new. The key here is to think about the way you use the worktop surfaces, and whether the space could be better used as a cupboard. Does your fridge freezer fit neatly in the corner, or would an integrated unit look better? Is the dishwasher appropriate, or would a pair of dish drawers be more economical? Jot down a list of everything in your cupboards and make sure you’ve got a place to store it all. Don’t forget items that may be lingering elsewhere, like mops, buckets or your ironing board, and factor in things you need for family pets. The ideal kitchen has differing sizes of units to accommodate food, utensils and cleaning accessories, while giving you space to feed the dog and store the hoover. If you’re short on space, but you enjoy dining in the kitchen, think creatively about the space you’re working with. Small families could use a kitchen island with coordinated worktop surfaces, or turn half of their dining seating into a functional storage bench. In a really small kitchen, look for tables that fold flat against the wall. If you’re finding it hard to imagine your new kitchen on paper, download a 3D design program and create a mock-up of the new space. Free software will allow you to get 3D view inside the room, so you can instantly tell if it feels too cramped or cluttered. If you have obstructions in the room that are hampering kitchen design, it may be worth moving them around. A badly placed boiler or boxed-in pipe can be a hassle to relocate, but if they’re out of the way, it could free up a lot of work space and give you a better, more usable layout. 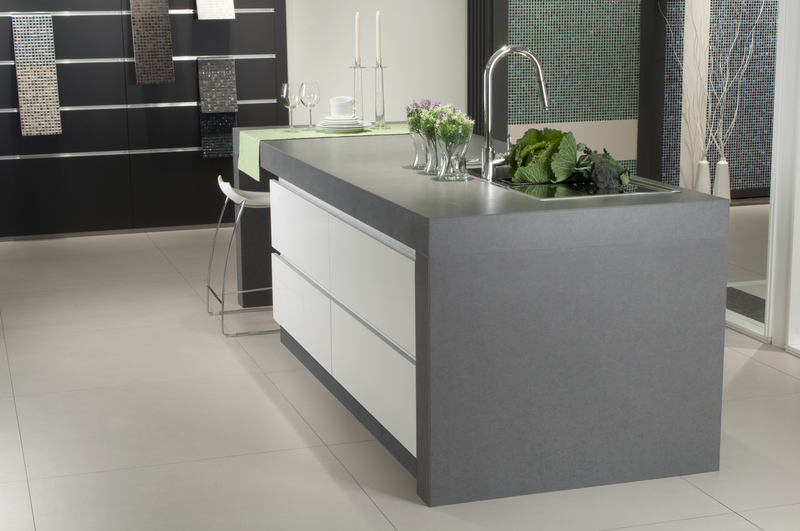 Modern kitchens can incorporate all kinds of worktop surfaces, from concrete to granite, butcher’s blocks and more. Be sure to research the pros and cons of any unconventional surface, since some materials are likely to scorch or crack over time. If the worn-down look isn’t your cup of tea, acrylic work surfaces offer a good balance of sleek looks and longevity at an affordable price. Kitchen design isn’t just about cupboards; it’s about the way the kitchen functions as a family space. Use lighting to zone your dining area, or place a track along the ceiling so you can switch lights around each season. Spotlights and cupboard downlighers can make work surfaces easier to see. The main thing is to make the kitchen work for you and make it work for your type of cooking, every kitchen is different! 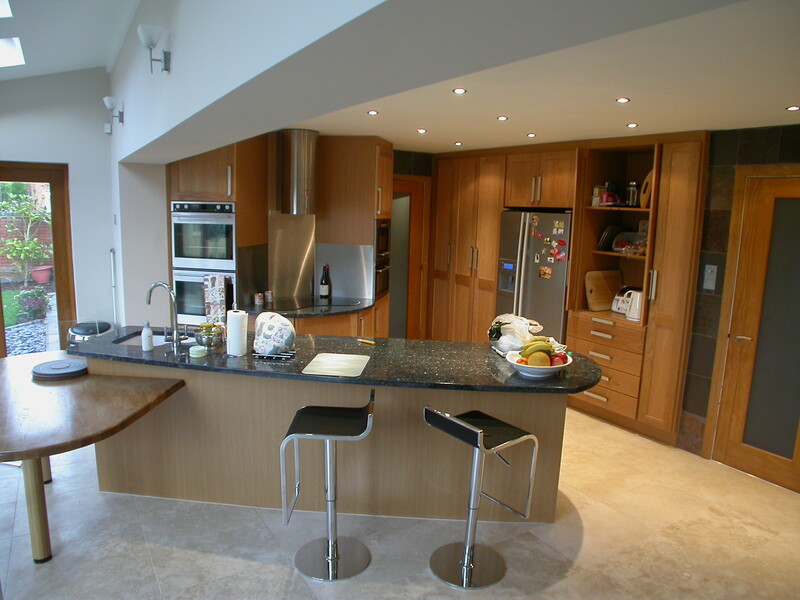 Get in touch with Ormishers for all the ideas and advice you could need when planning a kitchen.